So last weekend it was Mother's Day. I did the good daughter/daughter in law thing and arranged for some flowers to be delivered and made a couple of cards. I used papers, including the sentiments, from Paige Evans and die cut flowers from Jen Hadfield. 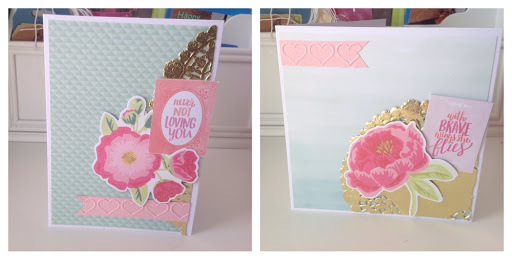 I originally thought about using an embossed background so I used a heart embossing folder from Stampin Up, but I couldn't get it to work so ended up just using a tiny slither. Why is it how you picture things in your head never come out right on paper?